Idaho Power seeks to suspend a program that returns credit to solar panel owners. 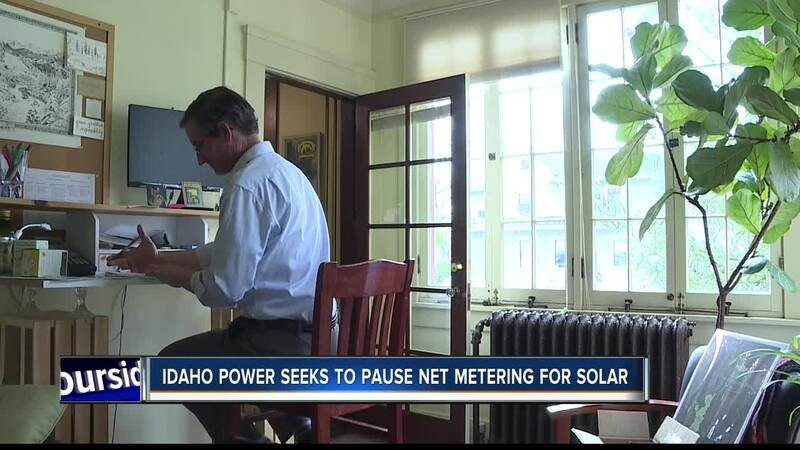 BOISE, IDAHO — Idaho Power is seeking to suspend the net metering program for customers who wish to power their commercial, industrial, or irrigation business with solar. "There's a lot at stake here," said Ben Otto, Energy Associate, Idaho Conservation League (ICL). "You're allowed to reduce your own power bill because you meet your own needs, but then if you have a little bit of extra that goes out onto the grid, you get a credit," said Otto. Solar users can take advantage of that energy credit in the future--for example, in the winter when there is less sun--to offset their bill some more. With the proposal to suspend this program filed Friday, an Idaho Power rep says they are looking to protect the investor. "Making sure that our customers that are contemplating putting multi-million dollar systems in are fully aware of any price that they would get paid for any excess energy," said Theresa Drake, Senior Manager, Customer Relations and Energy Efficiency, Idaho Power. But reps from ICL say the monopoly utility is trying to change the rules of the game just as Idaho's independent solar industry is starting to grow. "We don't owe Idaho power a certain amount of money. We're not obligated to consume a certain amount of their electricity," said Otto. According to an expert at Idaho NEM Solar, installation of solar panels in Idaho has grown significantly in recent years, with 31 thousand additions as of 2018. But that momentum would come to a complete standstill until another compromise is made, if state regulators decide to pass the proposal. And while ICL sees the proposal as disrupting consumer choice, Idaho Power sees it as protecting the consumer, as well as non-solar customers. "When more price is paid for what's actually the value of that energy, all other customers that aren't generating their own power end up picking up those extra costs," said Drake. Idaho Power uses a small amount of purchased solar generators among other energy forms (the majority is hydroelectricity, according to Drake). Friday's proposal comes after a recent announcement of their goal to provide 100% carbon free energy by 2045 .